Whitby Town fell to a disappointing 2-1 defeat against Stafford Rangers at the Turnbull Ground. Stafford took the lead just two minutes in when Thomas Thorley rolled home from close range. The visitors got their second on the stroke of half-time when Louis Briscoe scores a free-kick into the bottom corner. 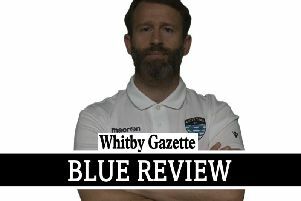 Whitby gave themselves a glimmer of hope after 86 minutes when Brad Fewster tapped in from close range, but Rangers were good value for their win and held on the claim the three points. Kieran Weledji shone for the Blues despite their defeat.